If like me, you are old enough to have memories of the great 75/76 League runners-up team, then I’m sure you will hold Stan Bowles as one of the greatest ever players. Perhaps your memory of that team is of Gerry Francis picking up the ball in his own half and driving deep into the opposition’s defence. Could it be Dave Thomas flying down the wing with his socks rolled round his ankles skipping over challenges and putting pin-point crosses over without breaking stride. Maybe its Don Masson dropping deep, spraying incisive 40-yard passes, or a willowy Don Givens waving to the Ellerslie Road Stand as he trotted back from scoring another stylish goal. Dave Webb maybe, pretending every opposition No.9 was his bank manager and kicking lumps off him? Everywhere you looked in that team there was skill, allied to hard working grit, experience and international class. Let’s be honest we can only dream of ever seeing the like at Rangers again. It’s not going to happen in the modern game, where youngsters are poached then stockpiled at academies of the top five Premier League clubs. If we produce a potential star now, they will inevitably move on. Not necessarily up, but definitely on. 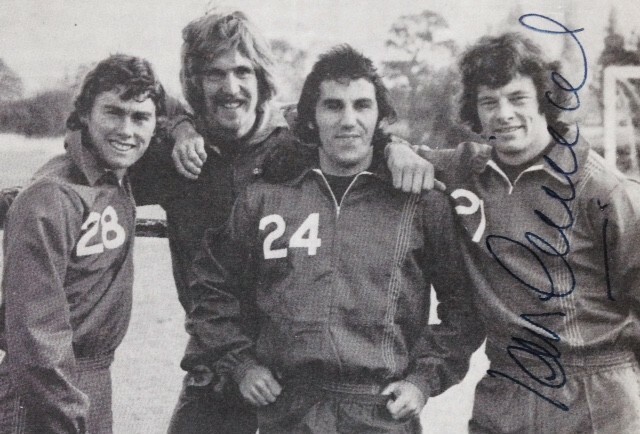 In those days media coverage was lower key, but the obvious stars of the team were the exuberant forward players. 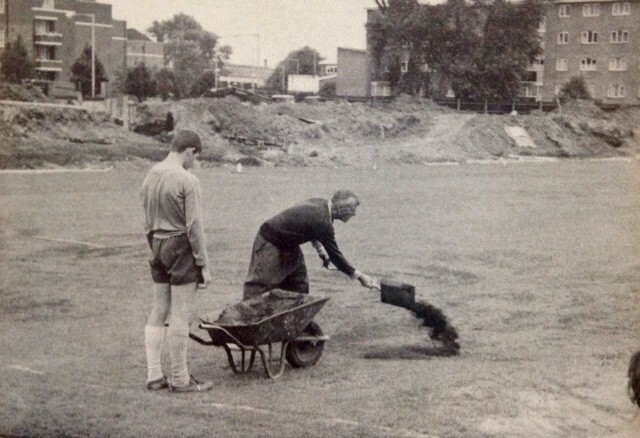 Never the hard working, hard grafting players who were the backbones of the side. Now the ‘Forever R’s’ club are making regular presentations to former players on the pitch it has brought back memories for me of one of my favourite players from that era. Yes, I idolised Stan, and thrilled to the wing play of Dave Thomas. But I always admired the commitment and tough tackling of our seemingly ever-present left-back Ian Gillard. How often did his curving through ball out of defence release Dave Thomas down the wing? Or a solid, thumping last-ditch challenge, snuff out a dangerous counter-attack. Ian Gillard made his debut for Rangers on 23rd November 1968 in a 2-1 home win against Nottingham Forest. He then went on to make 485 appearances for the R’s in all competitions, scoring 11 goals. His last appearance being in the 1982 FA Cup final replay against Spurs. Whilst with us he played for the England U23’s and also won three full England caps. It’s quite remarkable now to have a player spend almost 14 years at the same club. I believe he stands third on the QPR all-time appearance table. That first appearance against Nottingham Forest, was one of only four, first team starts that season. The following season he made 18 starts and became a regular in the side through December, scoring his first goal for the team on 17th January 1970, along with Rodney Marsh in a 2-1 home win against Cardiff. Over the next two seasons he was in and out the side until making the left-back spot his own in a 3-2 victory over Newcastle at Christmas 1973. In total making 29 appearances that season. By now he was developing a reputation as a tough tackling left-back. As I remember he stood 6ft 1in and was a threat at set pieces and a very useful addition at the near-post as defensive cover for corners. His trademark tackle was to show the opponent the outside and then slide in to consistently win the tackle with his trusty left foot. He wasn’t to be found constantly rampaging forward, this was the age of the full-back, not the wing-back after all. But he was totally comfortable on the ball and able to fit easily into Dave Sexton’s policy of total football. Suddenly dropping his shoulder and turning inside he could release a ball down the wing for Dave Thomas, or lay it off to the midfield. For me he was an integral part of our 75/76 team and often overlooked due to the presence of such flamboyant flair players in the side. But it was precisely the work rate and reliability of a Gillard, Webb or a Leach, that allowed the team to function as it did. Ian made 41 league appearances that season and only Phil Parkes being ever present in the league. In fact, the one game Ian missed was a 1-1 home draw with Birmingham City at the start of September. Who knows if Ian had played that point might not have been dropped and the whole season could have had a different ending! Having already played five games for the England U23’s, Ian was selected for his full England debut against West Germany at Wembley on 12th March 1975, England winning 2-0. Then again against Wales in the Home International series at Wembley on 21st May 1975, which finished 2-2. On 30th October 1975 he was in the England team, along with Gerry Francis that faced Czechoslovakia in Bratislava, eventually losing 2-1. This was a very eventful European Championship qualifier. The match was due to be played the night before but was abandoned after 17 minutes due to fog. Re-arranged for the following afternoon, Mick Channon opened the scoring before two Czech goals saw England lose and fail to qualify for the finals, finishing one point beyond the Czech’s who won the group. Ian had been booked in the early stages of the game and was given a torrid time by the flying Czech Marian Masny. Czechoslovakia went on to win the 1976 European Championship final on penalties after a 2-2 draw against West Germany, with Masny and Anton Ondrus they were a fantastic side. That was to be Ian’s last cap for England. The following season in the UEFA Cup, on 3rd November 1976, the Slovan Bratislava side containing most of the victorious Czech side came to Loftus Road for a second-leg tie with the game level at 3-3 after the first-leg. Rangers truly turned on the style again and ran out 5-2 winners in a thrilling match. But the real memory for me was after about 4 minutes of the game when Masny, (Ian’s tormentor in the international game) received the ball on the touch-line and was promptly dispatched into Row F of the Ellerslie Road Stand by our tough-as-nails left-back. Vengeance couldn’t have tasted sweeter! Making 46 starts in 1977/78, Ian made 43 appearances, scoring three times for Rangers in 1978/79, including our goal in a 1-1 draw at home to Man. Utd. I seem to remember it being a glancing, near-post header from a corner. But he was unfortunately part of the side relegated that season. He then stayed on for a further 43 appearances in our first season back in the Second Division, when surely an experienced former international would have been the subject of transfer talk. But for whatever reason he remained, providing valuable experience and guidance to the team. He was ever-present in the side in 1980/81 and made 46 appearances in 1981/82 before bowing out after the FA Cup final replay. Born in Hammersmith in 1950 and joining Rangers from school, he was very much a local lad, and certainly gave superb unswerving service to his local club. For me, alongside Mick Leach, he was one of the great, unsung heroes of the fantastic Gordon Jago/Dave Sexton side. Only Clive Wilson in the modern era has come close to challenging Ian for a place at left-back in my all-time Rangers team. He now continues that service as President of the ‘Forever R’s’ club. I do not believe you should bracket Ian Gillard with Mick Leach and Clive Wilson. He was head and shoulders more important in Rangers history than either of those two. A terrific piece Paul – I have just posted it on the ‘Ian Gillard – QPR Legend’ Facebook group that is administered by Ian’s son and daughter-in-law. What I loved about that 1975-6 side was how home grown talent like Ian and Dave Clement were on a par with top quality signings like Stan Bowles, Dave Thomas, Don Givens and Don Masson who also represented their respective countries. I’m so glad I was old enough to not only see 65% of the games that season but to also appreciate what I was watching. It is indeed great to see Ian in the role of President for ‘Forever Rs’. In my opinion there couldn’t be a better choice. Great article Paul. If it had not been for Masny I reckon there would have been more England Caps. Yep I will never forget his R’s debut against Forest. Great article about a great time to be an Rs supporter. That wonderful blend of old and young players produced the best football I have ever witnessed. Thank you Paul for reminding me of that wonderful period.